You are cordially invited to exhibit at the 33rd Annual Wisconsin SHRM State Conference this year which will begin on Wednesday, October 16, 2019. Plans are now taking place to bring you another great conference to be held at the Kalahari Resort in Wisconsin Dells, Wisconsin. The newly expanded Kalahari has doubled the size of their Convention Center providing even more space for exhibitors and attendees. Also, included in the expansion is enhanced load in and load out capabilities making it even easier for exhibitors. More than 1300 human resource professionals from across the State of Wisconsin attended our 2018 conference. As at past conferences, there will be many speakers presenting learning sessions containing the most up-to-date information on a wide range of topics. The conference features more than 8 hours of open exhibits including activities, food and beverage that will attract attendees to your booth. You will be able to participate in the activities and entertainment that is being lined up for your enjoyment Wednesday and Thursday in the exhibit hall. Thank you for considering the opportunity to exhibit at the 2019 WI State SHRM Conference. We hope to see you there! Setup is Wednesday, October 16th between 12:00 p.m. -3:30 p.m. Tear down is Thursday, October 17h between 3:00-4:30 p.m.
After June 1st booths are $1,250 for a single booth, $2,500 for a double booth as placement is based on availability. After September 1st booth prices increase to $1,550 single booth and $3,100 double booth. Location is based on availability. A maximum of 4 staff members per booth per day (8 for double booths) will be allowed. If different staff will be working the booth on Thursday, the departing Wednesday staff member must return their badge to the exhibit registration booth when they leave. Exhibitors must display a badge at all times. If you would also like to participate in the learning sessions, please register as a participant; exhibitor registration does not cover participation in those events. If you want electricity or booth rentals, you will need to request them from Valley Expo based upon their correspondence with you after your registration is conveyed to them. Any prepared food or any beverages served at your booth are subject to the Kalahari’s restrictions and/or fees. If you are planning a theme for your booth, please ensure that you are able to be recognized as part of our conference by displaying your badge. For safety reasons for you and our attendees, please refrain from wearing masks that make you unidentifiable. This year’s theme is “HR Trailblazers: Riding the Winds of Change.” Black and Orange will be the table skirting and white draping color for the Exhibit Hall. Click here to view the map. We are excited to announce, we are bringing back the booth decorating contest again this year based on this year’s theme (above). The winner will be recognized at Thursday morning breakfast to draw traffic to your booth on Thursday. It is expected that you will have someone available to staff your booth during the above noted hours. As a reminder, there is a maximum of 4 staff per booth per day (8 for double booths). The exhibit hall opens 15 minutes prior to when the morning keynote is scheduled to finish. During the day we will have our morning and afternoon breaks with beverages and plenty of snacks. In addition, attendee lunch will be buffet style with open seating in African West. Exhibitors will be able to go through the buffet line ahead of time and will eat in African West or in the exhibit hall at their booths. Tickets for lunch will be included in your registration packet when you check in. Please join us for an exciting night of entertainment and great food! If you wish to join us for the Thursday night social/food & entertainment you can purchase a ticket for an additional $50.00 per person. Although the Exhibit Hall closes at 2:30 p.m. on Thursday, you are still welcome to attend the conference as a participant on Friday. We have two keynote speakers Friday. One at breakfast and another over the lunch hour. Please note that your meal expense is not included in the exhibitor pricing for either of these key notes. The pricing is $50.00 per person, which includes breakfast, lunch, breakout sessions and keynote. If you wish to attend one or both keynote sessions on Friday you are more than welcome, however please be sure to register. Wednesday night you are welcome to partake in the appetizers throughout the hall. There will also be cash bars available. As an exhibitor, you will be provided with Thursday lunch and all breaks throughout the day. A max of 4 lunches (8 for double booth) will be provided to exhibitors upon registration for Thursday’s lunch. You need to provide us with each exhibitor’s name who will need lunch. If, due to staff changeover, any additional exhibitor lunch tickets are needed for Thursday lunch, you will be charged $25.00 per lunch. Your tickets for lunch will be in your registration packet you pick up when you check in on Wednesday. Exhibitors will eat in African West or in the exhibit hall at their booths. You will be able to start drawing names of the winners on Wednesday night and throughout the day on Thursday. All winners’ names will be posted on a media screen listing the name of the winner and giving them directions to pick up their prize at your booth. Please note: each booth will be limited to posting 4 winners. If your winner(s) do not claim their prize, you may want to consider either sending it to them or dropping it off at their place of business after the conference. The winner’s names must be submitted before 1:30 p.m. on Thursday. If you are unable to submit winners for booth prizes by that time, it will be up to exhibitor to ensure the recipient receives their prize. You can also choose to coordinate a giveaway right at your booth. This option would allow you to select your own winner. You can determine a time or a process in which you would announce a winner when the exhibit hall is open. If you elect to do your own drawing, we ask that you be courteous of your fellow exhibitors in your immediate area by respecting their exhibitor space and the noise level to the extent possible. Early Bird Price! Register by June 1st and pay only $975 for a single booth or $1950 for a double booth. Prices after June 1, 2019 increases to $1,250 for a single booth and $2,500 for a double booth. Registrations after September 1, 2019 will have a fee of $1,550 single booth and $3,100 double booth. **Electrical and any additional special requests for your booth should be requested directly with our on-site exhibitor services contractor, Valley Expo (you will receive communication from Valley Expo after you register). In the past, we have been very supportive of allowing our exhibitors to attend sessions pro-vided the sessions are not full and the exhibitor still maintains a presence at their booth. In recent years, several organizations have registered their HR staff through the exhibitor registration process to avoid the attendee registration fee. Due to this, we are asking that if you have staff attending for the main purpose of going to the learning sessions, they must register as an attendee. It is our hope that as a partner of our conference, exhibitors will respect this policy. We are under contract with Kalahari Resort for providing all food and beverages given to attendees. If you would like to serve any kind of prepared food at your booth, you will need to use Kalahari Resort services to prepare it or be subject to a fee. You must coordinate approval from the Catering Manager at Kalahari Resorts. If you are bringing any items in to give away at your booth that are food or beverages, you will need prior approval from the Catering Manager at Kalahari Resorts. Please also let us know that you have made these arrangements. If you would like to advertise in our conference program you can get additional information by clicking here. Please note if you exhibit there is a 10% discount off of advertising based on the size ad you would like. Primary exhibitors will be able to sign up for advertising during their registration process. Sponsoring is an opportunity to maximize your firm’s exposure at the conference while demonstrating commitment to the HR profession. Sponsorship packages range from $2,500 to $15,000. An exhibit booth is included with all sponsorships. Our sponsors are also rewarded with preferred placement in the exhibit hall in addition to other recognition opportunities throughout the conference on a first come basis. 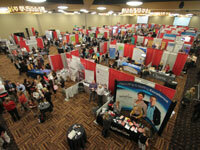 Exhibitors may indicate their interest during the registration process to become a sponsor. Should you choose a sponsorship level as part of your registration, one of Sponsorship Co-chairs will be in contact with you. If you wish to be a part of our Wisconsin SHRM State Council Website, you can purchase a spot in our online Vendor Directory. For the low cost of $300, you can select to be included on this page from January 1, 2020 – December 31, 2020. Your listing will include your company name, brief description of your organization or headline, contact information and a hyperlink to your company website. Look for this option as part of the exhibitor registration process. Each year we invite, encourage and support college students who have elected the human resource field as their professional path to be active attendees at our conference. As an exhibitor of this conference we are asking for your help to provide the same level of support to educate or provide insights into your products and services to the students. These individuals are the future of our profession. It may be that in less than a year, they are in positions that could influence decision making on your services or products. We really appreciate your willingness to partner with us. 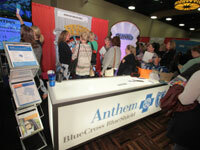 The Exhibitor agrees to maintain general liability insurance in an amount not less than One Million Dollars ($1,000,000) to cover its potential liabilities and to name Wisconsin Council SHRM as additional insureds under Exhibitor’s liability policy for the duration of the exhibit including move-in and move-out periods. Exhibitor shall assume responsibility for its officials, agents or employees, from theft, damage by fire, accidents or other causes. The Exhibitor agrees to make no claim against Wisconsin Council SHRM and will protect, indemnify, defend and save the above-named, harmless from any and all losses, costs, damages, liability, or expenses (including attorney’s fees) arising from or by reason of any accident, bodily injury, property damage, theft or loss, or other claims or occurrences to any person, including exhibitor, its employees and agents, or any business invitees, arising out of or related to exhibitor’s occupancy or use of the exhibition premises. Once registered we will be asking you to submit your certificate of insurance to us. Go to http://www.wishrm.org and click on the 2019 WI SHRM State Conference logo on the main page. 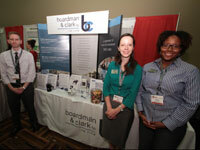 Once you are on the home page for the conference, click on the Exhibitors tab and then follow the registration process. 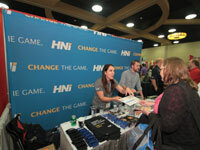 All registration fees must be paid in full at time of registration to secure your exhibit booth. Please note: you may complete your registration and pay by check, but your booth is not considered confirmed until full payment is received. A 50% cancellation fee will be charged for cancellations made by August 31, 2019. There will be no refunds for cancellations made after August 31st! Organizational ID (email address) & Password - Please realize that when you go to register as an exhibitor the email address of the person registering for your organization will become your user ID. In addition, you will be asked to create a password for your organization. Take note of this information as it will be your responsibility to keep up-to-date the names of the individuals from your organization that will be staffing the booth throughout the conference. Organization Single Point of Contact – To help facilitate communications for our exhibiting organization this year, when you register online, you will be asked to provide us with one point of contact for your organization. All exhibitor updates and information will be forwarded to this one contact. This individual can be different from the individual who registers your organization on-line. You will also find a link to our hotels and a timeline for the conference called “Conference at a Glance,” as well as information on conference attire, speaker, sponsorship and advertising information. This site will continue to be updated until the conference, so make sure to mark it as a favorite and return to it often. An excellent way to receive recognition for your organization is to donate a prize for our Grand Door Prize Give-Away. We are asking that the value of these prizes be of a $100 value or greater. These door prizes will be given away during our event on Thursday evening. Winners will be selected from the prize drum that will be located in the exhibit hall Wednesday night and throughout the day on Thursday. These prizes are separate from any prizes you give away at your booth from business cards collected. Please drop these prizes off to Exhibitor Registration by Thursday at 11:00 a.m.